It is not true, of course, that human beings are motivated in what they do exclusively by material interest. I don’t believe that at all, though critics of my writing often assume that I do. Because I tend to write about economically driven conflicts, many people presume that I subscribe to Marxist thinking and the explanation that the sum total of human affairs and interactions are based on material self-interest. That explanation is demonstrably untrue even in each of our own individual lives in innumerable ways. It is even demonstrable in our own interactions with the marketplace when we, for instance, buy goods we do not need, or which will go to waste, and the purchase of which actually depletes our wealth with no perceptible benefit to ourselves. We do not make those purchases with our material self-interest in mind at all; we may do it for any number of reasons, but we certainly do not do it seeking to profit from squandering our money. So no, if we are not driven, even in a large portion of our financial transactions, by the motive of material self-interest, it can hardly be stated that this is the motive behind everything else we do in life. I think the confusion about this arises from the fact that I discuss corporate power and its influence on politics, on international affairs, and government policy. But this is something entirely different from discussing the motives of private individuals. Corporations are profit-driven, exclusively so, and they are legally obligated to be this way. Material self-interest is their raison d’etre, full stop. That is not a theory; it is a fact in their articles of incorporation. If corporations are to be regarded as human beings, then, yes, they are the Marxist archetype of the pathologically mercenary individual. Corporations are also tremendously powerful. It can be argued that their extremely narrow purpose has helped them become so. With a single prime objective of accumulating profit, and very few restriction in place on how they pursue this aim, corporations have been able to grow into massive entities controlling a huge proportion of the global economy. This economic power inevitably includes political power; whether by means of direct funding of politicians and legislative lobbying, or by the sheer magnitude of their impact on “market forces” that can create de facto compulsion on governments to respond to circumstances that have been imposed by companies or coalitions of companies in any given society. So no, people are not driven exclusively by economic concerns, but corporations are, and corporations wield unparalleled influence over state policy, and over the overall conditions under which entire populations live; which means that yes, most major conflicts, both domestically and internationally, are indeed driven by economics. Again, this is not a theory, it is straightforward deduction from observable reality. There is nothing conspiratorial about it. There is no mystery. The operational nature of corporations is transparent; they are dedicated to the perpetual increase in profits for their shareholders and not for anyone else; this is their function. When they mobilize their power to serve this function, there is no surprise in that, nor is there any secrecy about it. Though they may claim to be concerned about the environment or about social responsibility and so on, everyone should understand that even these claims are motivated by the drive for profit, because that is the real, legal, and sole purpose of corporations, and that is unapologetically and openly acknowledged. When these powerful entities interact with weaker entities, for instance, with the governments of developing countries whose total GDP is often less than the revenues of multinational corporations; those who control these weaker entities must find ways to collaborate with these enormous institutions of private power which will enable them to survive and remain with some degree of authority still intact. This usually means that such governments are forced, rather than defend their domestic interests, to instead manage the process of capitulation with corporate power to deliver their countries’ resources (including human resources) to the much more powerful entities looming across from them at the negotiating table. I do not claim that corporations directly dictate to these governments precisely how they should do this; though that certainly does happen to some extent, particularly in terms of instituting economic reforms that are advantageous to foreign business; and we have seen instances of direct corporate involvement in military coups, armed conflicts, and political repression from Latin America to the Niger Delta to Aceh, Indonesia. By and large, I believe that it is left to the governments themselves to decide how best to pursue their new function in service to corporate profitability. This usually does not require much imagination in the developing world, since these governments are often already highly corrupt and exploitative in service to a small class of domestic elites. It can be a fairly seamless transition to merely include an extra tier of authority over what is an already existing system of exploitation and control. This is why military dictatorships are frequently preferred by corporate power for integration into the global economy; they have all the necessary mechanisms of coercion already in place and operating, and need very little instruction. All they usually need is the creation of a democratic veneer; though even this is not a necessary requirement. 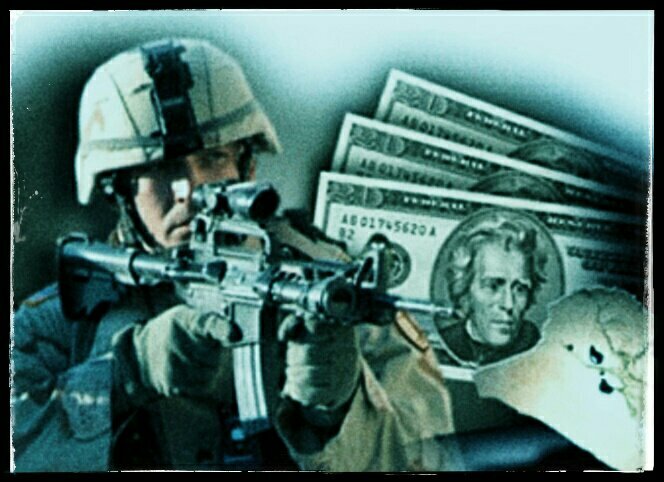 Identifying the economic motives behind conflicts is logical, not ideological, given the real existing power dynamics in the world today. It has nothing to do with theories about what drives human beings, and everything to do with what drives corporations. بالطبع ليس صحيحا، أن البشر مدفوعون إلى ما يفعلونه بالمصالح المادية فقط. أنا لا أعتقد هذا على الإطلاق، على الرغم من أن نقاد كتاباتي غالبا يفترضون هذا في، فلأنني أميل إلى الكتابة عن الصراعات التي تحفزها العوامل اقتصاديا، يفترض كثير من الناس أنني أميل إلى التفكير الماركسي وإلى التفسير القائل بأن مجموع الشؤون الإنسانية وتفاعلاتها تستند إلى المصلحة الذاتية المادية. ولكن هذا التفسير غير صحيح بشكل كبير حتى في حياتنا الفردية وبطرق لا حصر لها. بل أننا يمكن أن نثبت هذا حتى من خلال تفاعلنا مع السوق عندما نشتري سلعا لا نحتاج إليها، أو أشياء ستذهب إلى النفايات، وكل هذا بالفعل يجعل ثرواتنا تتآكل دون فائدة ملموسة تعود علينا، فبالتأكيد نحن لا نفعل كل هذا ومصلحتنا الذاتية المادية في عين الاعتبار!! قد نفعله لأي عدد من الأسباب، ولكن بالتأكيد نحن لا نفعله بهدف التربح من تبديد أموالنا. لذلك فإن كنا مدفوعين، حتى في جزء كبير من معاملاتنا المالية، بحافز من المصلحة الذاتية المادية، فلا يمكن أبدا أن نقول أن هذا هو الدافع وراء كل شيء آخر نقوم به في الحياة. أعتقد أن الخلط حول هذا الأمر ينشأ عن حقيقة أنني أتحدث عن القوة المؤسسية وتأثيرها على السياسة، وعلى الشؤون الدولية، وسياسة الحكومات. ولكن هذا أمر مختلف تماما عن مناقشة دوافع الأفراد. الشركات هي التي تكون مدفوعة بالربح حصريا، وملزمة قانونيا بأن تتصرف بهذه الطريقة. المصلحة الذاتية المادية هي سبب وجودها ((نقطة)). وهذه ليست نظرية، بل هي حقيقة في مواد تأسيسها. فإن كنا نعتبر أن الشركات كائنات بشرية، ففي هذه الحالة، نعم، هي النموذج ماركسي للفرد الجشع بشكل مرضي. بالإضافة إلى هذا فالشركات قوية بشكل كبير، ويمكن القول إن هدفها الضيق للغاية هو الذي ساعدها على تحقيق ذلك. فمع هدف رئيسي واحد عبارة عن “تراكم الأرباح”، ومع قلة القيود المفروضة على كيفية تحقيق هذا الهدف، تمكنت الشركات من النمو لتصبح كيانات ضخمة تسيطر على نسبة كبيرة من الاقتصاد العالمي. وتشمل هذه القوة الاقتصادية حتما السلطة السياسية؛ سواء عن طريق التمويل المباشر للسياسيين أو ممارسة الضغوط التشريعية، أو من خلال الحجم الهائل لتأثيرها على “قوى السوق” التي تمكنها من خلق “أمر واقع” يجبر الحكومات على للاستجابة للظروف التي تفرضها الشركات أو تحالفات الشركات في أي المجتمع. لذلك فلا، الناس غير مدفوعون حصريا بالمخاوف الاقتصادية، ولكن الشركات هي التي ينطبق عليها هذا الوصف، والشركات تمارس تأثير لا مثيل له على سياسة الدول، وعلى الظروف العامة التي يعيش فيها السكان كلهم؛ وهو ما يعني أن معظم الصراعات الرئيسية، على الصعيدين المحلي والدولي، مدفوعين فعلا بالاقتصاد. مرة أخرى، هذه ليست نظرية، ولكنه استنباط مباشر من الواقع الملحوظ. ولا توجد أية “مؤامرات” هنا في هذا الموضوع، فهو ليس شيئا غامضا. والطبيعة التشغيلية للشركات شفافة؛ فهي مكرسة لتحقيق زيادة دائمة في الأرباح لمساهميها وليس لغيرهم؛ وهذه هي وظيفتها. أي أنهم عندما يحشدون قوتهم لخدمة هذه المهمة، فهذا شيء لا يثير الدهشة ، كما أنه ليس أمرا سريا. وعلى الرغم من أنها قد تدعي أنها تشعر بالقلق إزاء البيئة أو المسؤولية الاجتماعية وهلم جرا، إلا أنه علينا جميعا أن نعلم أن كل هذا مدفوعا بالربح أيضا، لأن الربح هو الغرض الحقيقي والقانوني، الوحيد للشركات، وهم يعترفون بها علنا. وعندما تتفاعل هذه الكيانات القوية مع الكيانات الأضعف، مثل حكومات البلدان النامية التي يقل إجمالي الناتج المحلي فيها في معظم الأحيان عن إيرادات الشركات متعددة الجنسيات؛ يجب على من يسيطرون على هذه الكيانات الضعيفة أن يجدوا سبل للتعاون مع هذه المؤسسات الضخمة من السلطة الخاصة التي تبقيهم في كراسيهم السلطوية وتبقي لهم درجة ثابتة من السطوة. وهذا يعني عادة أن مثل هذه الحكومات تضطر، بدلا من أن تدافع عن مصالحها الداخلية، أن تدير عملية الاستسلام لقوة الشركات من أجل تقديم موارد بلدانهم (بما في ذلك الموارد البشرية) للكيانات الأكثر قوة التي تلوح في الأفق على طاولة المفاوضات. أنا لا أدعي أن الشركات تملي مباشرة لهذه الحكومات كيفية القيام بهذا؛ على الرغم من أن ذلك يحدث بالتأكيد إلى حد ما، لا سيما من حيث إقامة إصلاحات اقتصادية مفيدة للأعمال التجارية الأجنبية؛ وقد شهدنا حالات تورط الشركات بشكل مباشر في انقلابات عسكرية ونزاعات مسلحة وقمع سياسي من أمريكا اللاتينية إلى دلتا النيجر إلى آتشيه بإندونيسيا. وبشكل عام، أعتقد أن هذا سيتيح للحكومات فرصة أن تقرر أفضل السبل لمتابعة وظيفتها الجديدة في خدمة ربحية الشركات. وهذا عادة لا يتطلب الكثير من الخيال في العالم النامي، لأن هذه الحكومات غالبا ما تكون فاسدة للغاية واستغلالية في خدماتها التي تقدمها فقط لفئة صغيرة من النخب المحلية، وهذا يتم بشكل سلس إلى حد ما عن طريق إدراج مستوى إضافي للسلطة على ما هو قائم بالفعل للاستغلال والسيطرة. وهذا هو السبب في أن السلطة الديكتاتورية العسكرية كثيرا ما تفضل السلطة من أجل الاندماج في الاقتصاد العالمي؛ فهم يملكون جميع آليات الإكراه اللازمة ويعملون بها، ويحتاجون إلى القليل جدا من التعليمات. وكل ما يحتاجونه عادة هو خلق قشرة ديموقراطية، وحتى هذه قد لا تكون شرطا ضروريا. إن تحديد الدوافع الاقتصادية الكامنة وراء الصراعات أمر منطقي وليس إيديولوجي، بالنظر إلى ديناميات القوة الحالية القائمة في العالم اليوم. والأمر لا علاقة له بالنظريات المتعلقة بدوافع البشر، ولكن له علاقة بدوافع الشركات. Recently I had a conversation with a renowned expert in humanitarian relief and conflict resolution regarding ethnic cleansing in Myanmar against the Rohingya Muslims, and I expressed my concerns that the US might potentially back the fledgling militant group “The Arakan Rohingya Salvation Army” (ARSA). She disagreed, saying that the US had been very supportive of the Rohingya; they had welcomed refugees (before Trump), and had convened a Security Council meeting at the United Nations on the issue, facilitated relief work, and so on. What was interesting to me about this was that she believed these actions by the US precluded the likelihood of American covert support for ARSA, whereas I do not see the slightest contradiction between US expressions of concern for the plight of the Rohingya and their simultaneous exacerbation of that plight. But then again, I am American. The US does that kind of thing all the time. The US, let’s be clear, promotes democratic facades, not democracy. When the façade is flimsy, they criticize, and offer dictatorial regimes the necessary marketing strategies to obscure their authoritarian tendencies. Hold elections; talk about “transitions to democracy”, cultivating pluralism, and so on. Meanwhile, they will simultaneously facilitate the intensification of repression. Remember, American foreign policy is exclusively dedicated to securing the perceived “national interests”, and this translates to the interests of business. No regime is better suited for doing that than an authoritarian one; preferably a corrupt military government. The ideal situation is for any country to be ruled by an unscrupulous group of local elites who are ready and willing to collaborate with global elites to deliver their country’s resources in exchange for a percentage and a guarantee of immunity. One of the best mechanisms for camouflaging the fact that a client regime is tyrannical and not even slightly interested in democratic reforms (which no one in power really wants anyway), is the creation of, or the encouragement of, internal conflict. A military government can then impose brutal crackdowns in the name of securing peace and tranquility; while the actual objectives are the subjugation of popular dissent, the prevention of democracy, and the ruthless protection of vital business interests for themselves and their global sponsors. It is understood that the sponsors will occasionally reprimand the regime for particularly egregious atrocities, but these reprimands will be hollow, and the regime is allowed to ignore them. In fact, they are essentially part of the mechanism required to enable the regime to continue, as they serve to abate any public pressure on the international community to actively intervene. They are permissive condemnations, and everyone involved understands this. In Myanmar, the central government’s real problem is the Rakhine, not the Rohingya. The Rakhine are an ethnic minority living in a resource-rich, and strategically important state, who have a history of secessionist ambitions. They are oppressed, exploited, and impoverished, and if they rose against the government, it would be a lethal blow to the Burmese. As long as their resentment and hostility are directed against the helpless Rohingya, the regime is secure. Internal conflict in Arakan, therefore, is useful to everyone who matters. The Rohingya, however, may need to be slightly less helpless in order for this conflict to be sustainable. Hence, it is entirely possible that the US will covertly, with the help of conduits in the Gulf States, try to foster a semi-viable militant movement in Arakan; and probably is already doing so. And this is entirely for the purpose of supporting the central government, increasing US ties to the Burmese military, and previous expressions of support for the Rohingya do not contradict with this strategy at all, but rather align with it.